Rescheduling/Cancellation of Portrait Session: As a professional photographer, and in order to give you the best, most relaxed session possible, Ever After Portraits limits the number of sessions that we photograph. That way, our attention is totally focused on you and your experience. Because reserving your date requires Ever After to turn away other business, we reserve the right to charge a $100 fee to change your date. Excellent customer service is our goal. We view terms and conditions as tools that help us ensure that clients have a wonderful experience. A Reservation Fee must be paid in full to secure your session date. Sessions must be during the week. Weekend sessions can be scheduled for an additional fee. Baby sessions will generally last an hour (two hours for Newborn Sessions) and will be held at our indoor or outdoor studio. Other policies listed below regarding PAYMENT, DESIGN SESSION & COMPLETED SURVEY, ORDERING SESSION, PRODUCT ORDERING & PAYMENT, GENERAL POLICIES and COPYRIGHT apply to Maternity, Newborn and Bebe Coterie. The Newborn Session is scheduled in the first seven days of life, when your baby is still bendy and super sleepy. The Reservation Fee for this session is $250. Book a Newborn Session and add a Maternity Session at the same time for only $100 more, $350 total. Included with this year-long Bebe Coterie Baby Plan package are three custom photo sessions which document your child as a Newborn, at 6 to 8 months (sitting), and at 12 months (standing/walking). The fee for this package is $750. PAYMENT FOR BEBE COTERIE BABY PLAN is required up front and in full to guarantee session availability. Please note: Your sessions will not be secured until payment is received. Our Reservation Fee secures your session date and covers artist’s time/talent only. No products are included. No substitutions of session or products are available in this program. The Bebe Coterie Baby Plan is non-transferable and expires when the child is 18 months. All three portrait sessions must be of the same child. A DESIGN SESSION allows us to do our best work, so it is required to fulfill the agreement to photograph your sessions. The Design Session is typically by phone, but we can do it in person as well, so you are most welcome to come to our studio. We always do a Design Session before the first Portrait Session (Newborn) so we are on the same page regarding colors, props, etc. If a Design Session is not held prior to the Portrait Session, your Portrait Session will be postponed. When we set the date for your Portrait Session, we will also set a date for your Ordering Session. For our Bebe Coterie Baby Plan, all three sessions will be held in our fully equipped indoor or outdoor studio. All appointments must be scheduled at the same time following baby’s birth so that we can guarantee session availability — this way you won’t miss out on a session because our calendar is full! For the best possible outcome for your exclusive session, the Newborn Session MUST occur within the first 7 days. If you do not contact us, and the session cannot be held before the baby is more than 7 days old, we will require that the Newborn Session be held at our studio before the baby is 10 days old. If the session does not occur before the newborn is 14 days of age, the session will be forfeit. The Newborn Session generally lasts 2 hours and can take as much as 3 hours, as we generally like to allow time for the baby to settle into sleep, be fed and changed when necessary. The remaining portrait sessions will generally last an hour and will be held at our indoor or outdoor studio. In addition, at least 35 proofs will be available for ordering. Parents, sibling and grandparents are welcome, but we cannot combine sessions with other families. Depending on availability, weekend sessions can be scheduled for an additional fee. In order to give you the best, most relaxed session possible, Ever After Baby Portraits limits the number of sessions that we photograph. That way, our attention is totally focused on you and your experience. 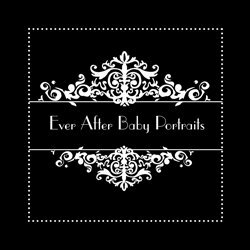 Ever After Baby Portraits turns away other prospective clients and prospective business in order to hold your scheduled time. If you are more than 15 minutes late for any scheduled photo shoot, and no contact has been made with the studio, you will lose the scheduled time, and your session fee will be used to compensate the photographers for their time. For a Newborn Session or a Newborn Session with an add-on Maternity Session, we offer Rewards which can mean as much as 20% off. For Bebe Coterie, our Rewards pricing applies to the entire year and can mean as much as 20% off. Each session must be ordered from before the next Portrait Session is held. Images must be ordered within 60 days of your Portrait Session. You are under no obligation to purchase any portraits, and there is no minimum purchase required. All orders must be placed at your Ordering Session, which will be at our studio. We do not offer proofs that leave the studio. It is at this time that you will make your portrait selections and place your order. Your family may also order at this time. Any portraits that you want, family members want, or friends want, must be ordered at the Ordering Session. It is understood that the images not ordered from the Portrait Session will be deleted after the ordering session. Due to space constraints, this is true even if no order is placed. Because you will have had the option to purchase, your session fee will not be refunded. Due to the custom nature of our photography, all orders are final and non-refundable once ordered Approval of proofs is required before any products are delivered. Your signature to our initial agreement indicates that you understand that any portraits that you choose to purchase must be paid for in full before products are delivered. ALBUMS: Albums are designed with no less than, on average, 2 images per page. Pages could have as many as 6 images or as few as 1 image, but generally are designed with 4-6 images per 2 pages. Some pages may have more, some less, to allow for design with similar images. Images ordered for the Album are final and cannot be changed at a later time. Layaway payment plans are available. With 25% down, no interest is charged. Payments must be completed before your products are delivered. Simply make the payments in the amount and for the term that you choose; when payment is complete, your images will be delivered. Ever After accepts cash, check, MasterCard, Visa, Discover, American Express and PayPal. There is a $25 fee for any bounced check. If you bounce a check, you must pay for your order and bounced check fee in cash. There are no refunds of any kind. In the case of a move, you may use the remaining sessions as credit towards items purchased at your Ordering Session. While image files are available for purchase, proofs have no value so after an ordering session, unordered images are purged unless an album has been ordered. Ordered images will be retained for six months to accommodate reorder requests. There is a minimum reorder fee. If no Ordering Session is held, unordered files are disposed of. We reserve the right to charge additional fees in the event anything is redesigned or retouched more than three times.